The creator of Mickey Mouse and founder of Disneyland and Walt Disney World. Dwarfs", "Pinocchio", "Fantasia", "Dumbo" and "Bambi". "Mickey Mouse Club" television shows. 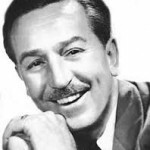 Walt Disney, along with his staff, received 48 Academy Awards and 7 Emmys. Awarded Presidential Medal of Freedom. Mother Chapter, Kansas City, Missouri. Initiated 1920.